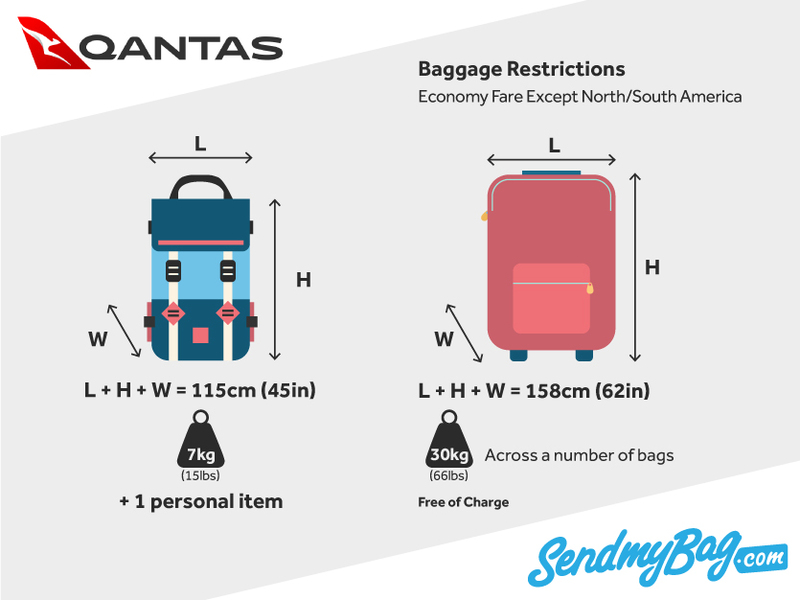 Review Qantas baggage size restrictions and fees before you travel. Take the stress out of travel by sending your luggage with Send My Bag. Have your bags waiting at your hotel on your arrival, or have them delivered once you have arrived at your new home abroad. You can have many more of your belongings with you than the Qantas baggage restrictions would allow and you get to enjoy a much more pleasant journey. Get you free quote now. International flights, Economy: 1 x 15 lbs (7 kg); 45 in (115 cm) in total dimensions OR one non-rigid garment bag; 73 in (185 cm). Higher fares: 2 x 15 lbs; 45 in OR 1 x 45 in bag, plus 1 garment bag. Australian domestic: EITHER two bags with total dimensions no greater than 41 in (105 cm) OR one bag measuring 41 in, plus one non-rigid garment bag measuring no more than 73 in (185 cm) OR one bag with total dimensions of 45 in (115 cm). Bags must weigh no more than 15 lbs (7 kg) each. On Dash 8 services, passengers may carry on board one item of hand luggage measuring no more than 41 in (105 cm) in total dimensions, and weighing no more than 15 lbs (7 kg). Passengers may also bring on board a small personal item, such as a purse or laptop (in a thin bag). Passengers may also bring on board a small personal item, such as a handbag or laptop (in a thin bag). They may also carry on board an overcoat, small camera, a reasonable amount of reading material, and a small amount of duty free (where allowed). Infants are not given a carry-on baggage allowance, but the accompanying adult may bring a diaper bag in addition to their own allowance. A musical instrument weighing no more than 15 lbs (7 kg) may be placed in the overhead locker. The instrument must fit within the allowable dimensions above. Larger instruments can be brought on board if an extra seat is purchased for the instrument. International flights (not N/S America), Economy: Up to 66 lbs (30 kg) across a number of bags, free of charge. Total dimensions of each bag must not exceed 62 in (158 cm). Premium Economy/ Business: 88 lbs (40 kg). First: 110 lbs (50 kg). Flights to/from N/S America, Economy/ Premium Economy: 2 x 50 lbs (23 kg); total dimensions of the two pieces must not exceed 106 in (270 cm), Business/ First: 3 x 70 lbs (32 kg); total dimensions of the three pieces must not exceed 159 in (405 cm). Australian domestic flights, Economy: One piece of checked baggage, included with ticket. Maximum 50 lbs (23 kg) and total dimensions of 55 in (140 cm). Business: 2 x 70 lbs (32 kg). Exceptions apply on smaller aircraft and a small number of routes. Infants are not given a checked allowance on domestic flights, but are allowed one piece with total maximum dimensions of 45 in (115 cm) and up to 22 lbs (10 kg) on international flights to/from North/ South America. On most other international flights, they are permitted 22 lbs across a number of bags (except on certain aircraft/ routes). Three additional items may also be carried for infants, including a pushchair/ cot/ car seat. Australian domestic: A$78 for first extra piece, A$90 for the second and subsequent pieces; $50 for each piece weighing over 50 lbs. Between Australia and North/ South America: A/US$175 per extra piece; A/US$75 for any single piece over your pre-purchased baggage allowance. Qantas Checked Baggage and Sporting Equipment, etc. Exceptional items, such as sporting equipment and musical instruments form part of your checked baggage allowance. Some equipment and large musical instruments may need to travel as freight, such as surfboards measuring over 109 in (277 cm), or 94 in (40 cm) on QantasLink Dash 8 flights. Freight charges apply. Looking for Qantas sized hand luggage?